BathAire(sm) provides sanitary hydrotherapy benefits without the cross contamination risks and cleaning hassles of those old fashioned whirlpool tubs or so called air spa systems. MasterCare developed BathAire(sm) as a closed loop aeration system with custom made, top accessible, and self-sealing aerators that introduce into the tub heated, scented, variable speed air. MasterCare’s BathAire system has self-sealing umbrella check valves in a custom made top accessible aerator that is easy to check and replace, which makes maintaining your MasterCare spa or specialty bathing tub a breeze. This aerator also has a multitude of openings to allow release of millions of heated, scented bubbles – bottom to top – for soothing, relaxing cleansing action on delicate skin. BathAire(sm) especially aids in cleaning all those hard to reach and sensitive areas of the elderly and those with complex medical needs. It’s also very helpful when a good soak in the tub is needed for aching muscles or to relieve tension. 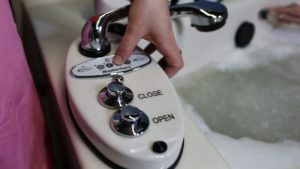 It can be turned on with any water level in the tub – and therefore ideal for extremity soaks. BathAire(sm) also greatly reduces cross-contamination. MasterCare’s BathAire(sm) is operated by a touch pad and the bubbles can be increased, decreased or pulsed with a touch of a button. Because BathAire(sm) is not whirlpool or whirlpool like, you can run the heated air if your residents want to enjoy seated showering, or with any level of water in the tub! The air can also be scented with MasterCare’s Aromatherapy feature. This is another standard feature on MasterCare’s spas and tubs. The Aromatherapy canister holds a pouch of beads to introduce a variety of soothing or invigorating scents throughout the air in and around the spa via the BathAire(sm) system. The purge cycle for BathAire(sm) automatically comes on after it has been idle for 20 minutes. It runs for 60 seconds, as a preset of the blower and cannot be turned off. This function dries the residual water from around the aerators. BathAire(sm) saves precious resources – your staff’s time and your money – simply because cleaning a MasterCare tub is surface scrubbng only; following your facility’s protocol and using our MasterCare BathAire System Disinfectant, following the directions for cleaning or sanitizing. Contact us to see for yourself why BathAire(sm) is a much more sanitary, relaxing, better option for your Elder care, other residents and even your staff.